Tomorrow, the biggest comic shop in the UK, Forbidden Planet on Shaftesbury Avenue, London, is having a signing with Jim Mahfood and Scott C, to celebrate their books Carl: The Cat That Makes Peanut Butter Sandwiches and Double Fine Action Comics Volume 1. They intend to spend the hours from 4pm to 7pm signing and sketching for the cool cats of Soho. 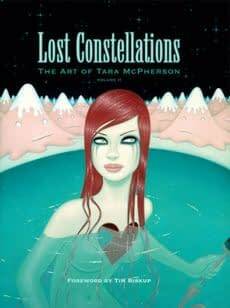 And the day after, they have Tara McPherson signing her new book Lost Constellations from 6pm to 7pm. Two cool catches, for Forbidden Planet, I’m sure you’ll agree. But there’s another catch. Protesting against the sacking of two employees, the drivers of the tube trains on the London Underground are going on strike. The current mayor isn’t exactly union friendly, and there have been a few strikes already this year. This is a full 48 hour strike however, starting in an hour or so and continuing for 48 hours.